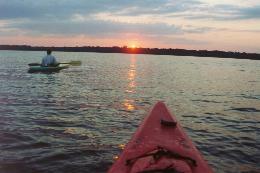 I join a friend for my first kayak trip down the storied, historic Cross Creek, so named because it connects two rich fishing lakes: Lake Lochloosa and Orange Lake (photo at left). We entered the creek at dusk near the Cross Creek bridge, and find that there is no easy canoe or kayak access to the creek. Once in the water, we head north toward Lake Lochloosa. We are pleased to find few, if any, motorboats on the lake or creek that day, which is unusual in light of the popularity of the area for fishing. Cross Creek and Lake Lochloosa are both home to a large number of wading birds and birds of prey, which both circle above us and hunt in the water nearby for food. Cross Creek has a relatively narrow channel, although there is a large amount of weed growth along the banks and an area of openness on the sides before you reach the tree line. Very little development along the northern stretch of the Creek. The colors at dusk are outstanding. An orange tint bathed the forests and water with a bronzed hue, as we experienced a very impressive sunset while we quietly and lazily lounge around on our boats on a gentle Lake Lochloosa (see photo below right). 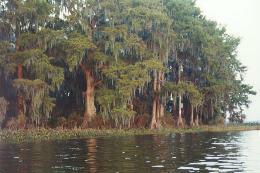 Lake Lochloosa is a 5,700-acre lake famous for bass, bream, crappie and catfish fishing. 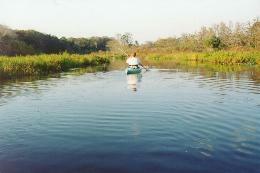 Designated as a Fish Management Area in 1965, Lake Lochloosa is part of a 602-square mile Orange Creek watershed, which also includes Paynes Prairie and Orange and Newnans lakes. Containing a wide diversity of aquatic and wildlife habitat, the watershed supports abundant populations of fish, native animals and the largest number of bald eagles in north central Florida, plus hardwood swamps, sawgrass marshes and wet prairies. Cross Creek is in southeastern Alachua County and was made famous by the books of Pulitzer Prize-winning author of "The Yearling", Marjorie Kinnan Rawlings. Her cracker farmhouse and orange grove are now a State Historic Site operated by the Florida Department of Environmental Protection Division of Parks and Recreation. Her home is taken care of each day by park rangers and volunteers, and is so authentically restored and preserved that one can imagine that the famous author still lives there. In fact, little has changed in Cross Creek since Rawlings' day. Marjorie Kinnan Rawlings arrived in Cross Creek in 1928. She was struck by its remoteness, wildness, simplicity of life and its Florida Crackers. She bought a home on the creek. Marjorie started a successful writing career here that leaves a legacy of life in the Cross Creek region. Marjorie bequeathed most of her property to the University of Florida. A staff of two full-time, one half-time person and four part-time tour guides maintain the garden, grove, house, animal care, visitor services, special school tours and general housekeeping tasks. The above information about Rawlings and Cross Creek is based on research from Floridian Kay Harwell Fernandez. She has been an award-winning writer and editor for 20 years. Her topics run the gamut, but she specializes in travel, arts and culture travel, and film.